Dale Klein was born in Buffalo NY and spent most of her life in Upstate New York. After 25 years as a Clinical Social Worker, she received her Bachelors Degree in Studio Art in 2006 and her MFA from Rutgers in 2010. She is now living and working in Rochester. Dale is a painter and printmaker whose primary interest is in the post-industrial landscape of the Northeast United States as a microcosm of what is happening to our country and most of the developed world. She is interested in the concept of entropy and how it affects contemporary life. Working on the boundary of abstraction and realism, she transforms her world in order to delve into it deeper emotionally and let the viewer bring his or her preconceptions to it. Since 2006, Dale’s prints have been in numerous national juried shows and have won several prizes including the Purchase Prize at Hunterdon Museum of Art. She had solo show at the Washington Printmakers Gallery in 2012, a two-person show in Rochester in 2009 and a three-person show at Nazareth College in Rochester in 2105. She has been chosen to participate in two juried portfolios, the Syracuse University Printmaking Department MFA Portfolio and the Purdue University Portfolio, Disguise. In 2012 Dale was commissioned to create the annual patron print for the Memorial Art Gallery in Rochester and in 2015, The College at Brockport purchased a print for its new Liberal Arts Building. Her work was also selected to be in the Los Angeles Printmaking Society’s 20th annual show and she was admitted to the LA Printmaking Society. She has been awarded a residencies at the Vermont Studio Center, the Hambidge Center, and The Millay Colony. 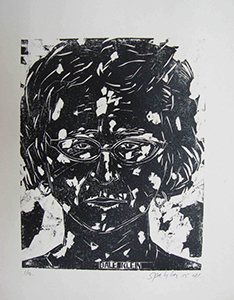 She has taught printmaking at the Garfield Middle School in Revere, MA and printmaking, painting, and drawing at the Creative Workshop at the Memorial Art Gallery in Rochester.